Give a smoked ham sandwich bruschetta-style appeal with fresh tomatoes & basil. 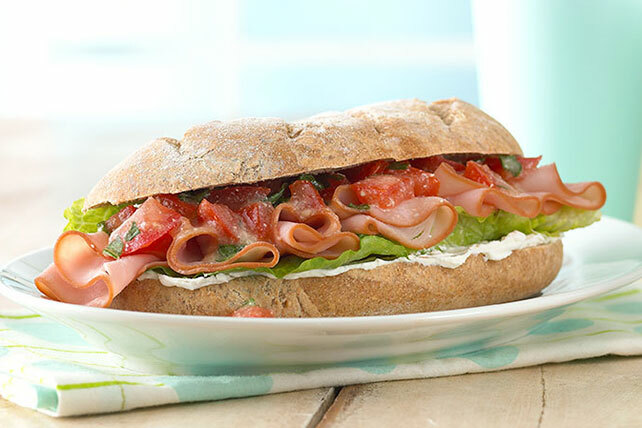 Put together a Bruschetta & Ham Sandwich for a lunchtime delicacy! Spread bottom halves of buns with reduced-fat cream cheese. Fill with lettuce, ham and tomato mixture. Prepare using OSCAR MAYER Natural Slow Roasted Turkey Breast or Slow Roasted Chicken Breast. Don't have fresh basil? You can use 1 tsp. dried basil leaves instead. These delicious sandwiches can be made ahead of time. Wrap individually in plastic wrap. Refrigerate up to 24 hours before serving.